Doing such type of ride in India is always a challenge. We need to overcome a lot of hurdles during the ride. Let me put it short about my experience. The ride was accomplished with me on my Harley Iron and my co rider S.A.C. 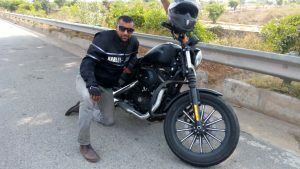 Vasanth on Harley Fat Bob. We completed the Long Distance Rider’s Full Throttle designation from Coimbatore to Pune back to Coimbatore on May 7th 2016. At the start 0-150 km, it was raining and our distance completed was not what we had planned. There were many near misses during the ride. No matter the difficulty, we make sure safety was the main concern. Water, breakfast bars and energy powder drink kept us going. The route we took had many speed breakers and proved to be highly dangerous. The road from Satara to Pune had many diversions due to road work. This happened for about 60km. Heavy rain prevailed as we were entering Pune which continued for about 1 hour. My bike has a small fuel tank which made us take many fuel stops. We got stuck in Pune Mumbai highway traffic for about 2 hours. We compensated this loss only by reducing our sleep time. The last 3 hours of the ride I was totally exhausted due to the poor conditions. For every 75km, I was making a stop to complete it. One way I could cheer up during the ride came mainly from my co-rider, who kept planning to overcome our challenges that we faced during the ride. We stayed connected by Bluetooth. I thank LDR and other riders who kept tracking us during the ride. Although exhausted at the end of the ride, I was also exhilarated and proud to have completed this Full Throttle challenge. No Replies to "India - Full Throttle - Coimbatore - Pune - Coimbatore"